The U.S. cannabis industry will pump up to $44 billion annually into the country’s economy by 2020 if current business and legalization trends continue, according to exclusive data released today in the 2016 Marijuana Business Factbook. Published by Marijuana Business Daily, the report estimates that the industry’s annual economic impact will soar from $14 billion-$17 billion in 2016 to $24 billion-$44 billion in four years. The projections reflect marijuana’s march towards the mainstream as it emerges from the shadows to become a respectable, above-board industry that is giving birth to scores of jobs, fostering new business opportunities and creating a broad ripple effect across the country. The estimates attempt to capture the industry’s overall contribution to the economy, encompassing everything from revenues generated by cannabis-related companies, licensing fees and taxes to marijuana tourism, employee spending, job creation and the impact on real estate prices in a community. The figures are based on sales of medical and recreational marijuana at the retail level (including flower, infused products and concentrates). Overall, for each dollar spent by marijuana patients/customers at retail, an additional three dollars in economic benefit is realized, according to the Factbook. The report estimates that retail marijuana sales will hit between $3.5 billion and $4.3 billion in 2016, up roughly 17%-26% from $3 billion-$3.4 billion last year. The Factbook estimates that sales will climb to as much as $8 billion in 2018, when states that legalize this year will likely start coming online, and up to $11 billion in 2020. Additionally, sales of recreational cannabis could surpass those of medical marijuana as early as 2018, though MMJ revenue will continue to make up a big piece of the pie. 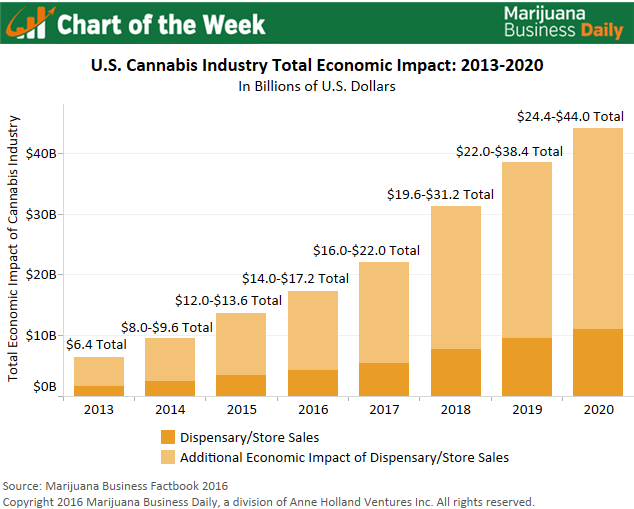 The sales and economic impact estimates include wide ranges to account for the massive amount of unknowns inherent in the industry, including legalization, regulations and the inevitable hurdles and delays new markets face. The low-end projections are particularly cautious, while the higher-end ones assume a more promising scenario in terms of legalization and growth. Walsh cautioned that any number of factors could slow growth, such as the election of an anti-cannabis president or a backlash by communities. But the long-term prospects look exceedingly bright, and any near-term challenges will likely only be a blip on the radar given marijuana’s momentum, he said. This fall could be a particularly historic time for the marijuana movement. Several key states could legalize recreational cannabis in the November election, including California, Nevada and Massachusetts, while Florida and Ohio could legalize medical marijuana.